~ Do Something/ANYTHING out of your comfort zone every day! Just the act of doing this makes you stronger. If it makes you a little nervous, then it probably has the potential to result in true growth. ~ Write a thank you card or letter to someone who has helped you in your career just to let them know you appreciate them. Do not ask for anything from them in return. Just show sincere gratitude. ~ Send a press release to your hometown newspaper about what you are doing in your career. Smaller papers often like this because it is a “Small town boy makes good” kind of thing. And newspapers along with websites and blogs are always looking for new material to write about. ~ Write down 10 things you are grateful for every day: 5 Before you go to sleep and 5 when you wake up. I know some of you may be thinking … “Alright you hippy, how is THAT gonna help my acting career?” Glad you asked. Because many actors (and most people for that matter) like to wallow in the problem. But when your brain focuses on and searches for the good stuff, that is want the mind finds. And what you focus on expands. So let’s expand on the good stuff! 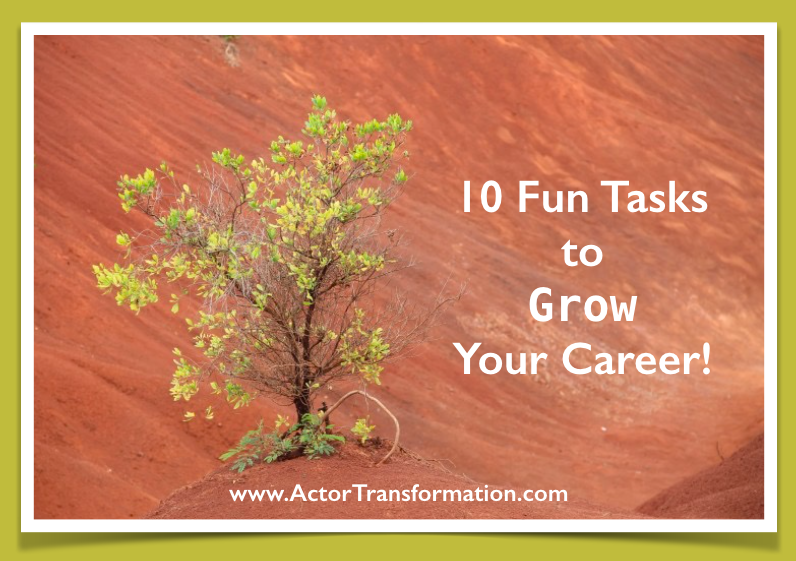 (This small task will help not only your well-being, but your life and your career! ~ Pick your hit lists. Make your top 5 hit list for TV Shows you want to be on, Casting Directors you want to read for, Agents or Managers you wants to target, Producers or Directors you want to work with, and so on. When targeting shows, do not just list the shows that you like. Target the shows that you actually have a shot at being called in for. When actors want to “do it all” then they often end up not doing anything. But if you get very specific in how you spend your time, energy, and resources, those doors can start to open up to you. a “Vision Board” for your career and your future. ~ Limit your exposure to lazy, perpetually sad, or negative people in your life. shifts your state of mind and energy level. (This is one of those things that is really easy to NOT do, but if you actually do it you will be happy you did!) Perform an act of random kindness today. This one truth alone can change your career and your life!